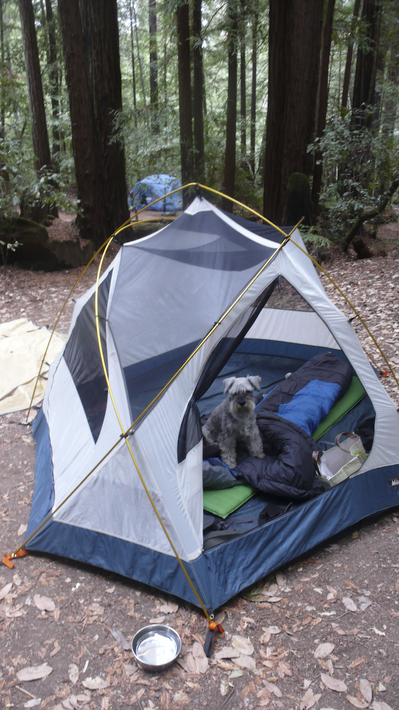 Earlier in the fall we took Hobie on his first camping trip, to Big Basin Redwoods State Park. Dogs are allowed in the campgrounds (leashed) and on a fire road. We got there after dark, but that didn't stop Hobie from barking like a crazy dog when I left the car to check in. Fortunately, he calmed down as soon as his little pack got back together. We stayed in the Wastahi Campground (PDF map of park). We stayed in site 85, which was fairly secluded (site 86 was even more secluded). Stay away from the sites just down the road from 85 - they are right next to each other. There were a few other dogs nearby, and it looked like most of them were off leash while inside the camp site. The campsite itself was pretty nice, although Hobie found it a little cold for his liking. 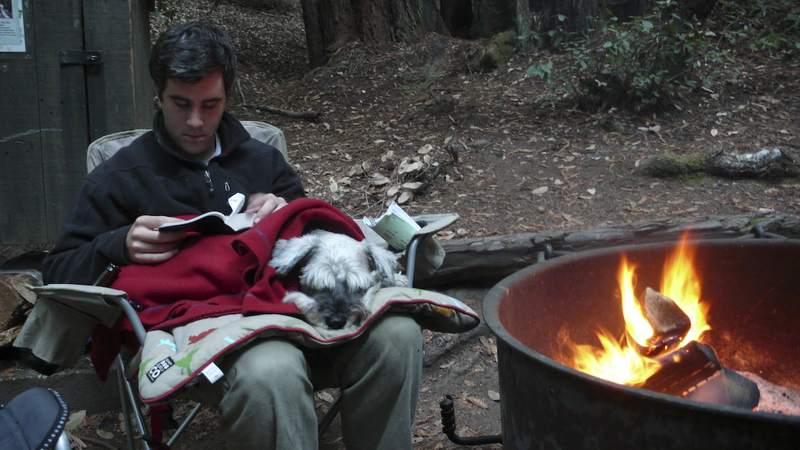 We could just bundle up and sit near the campfire, but Hobie wasn't quite happy sleeping on his pad. However, when I put him (and his pad) on my lap he quickly curled up and fell asleep. Since Hobie is not allowed on any of the trails, we had to walk along the main road to the fire road, near the check-in point. It's about a 20-minute walk away from the check-in point and the main day-use parking lot. The fire road is a couple of miles long, and it's a pretty nice walk. It starts out as a two-lane paved road (closed to traffic), but turns into a more conventional fire road about a mile up. On the way there are a lot of day-use areas there were closed off (not sure of it was because it was late in the season or because of budget cuts). We bring water when we go hiking with Hobie, and a few sips of water tends to get him (and us) re-energized. We stayed there for two nights, and the next day Hobie figured out that in addition to my lap, the sleeping bags also made a comfortable sleeping surface. On overall, this was a good campsite to bring Hobie to, although the hiking options were pretty much limited to one fire road. This page contains a single entry by Kris published on November 8, 2009 11:14 PM. Happy Halloween! was the previous entry in this blog. Camping on the Big Sur coast is the next entry in this blog.